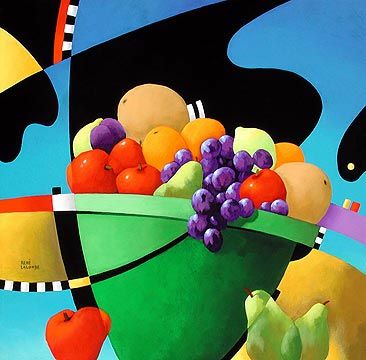 René Lalonde Limited Edition Hand Pulled Serigraph:"Healthy Still Life"
Edition Size: S/N to 237, Each print is hand-signed by the artist and numbered. Medium: Hand-pulled serigraph on gesso board. Blending the traditions of surrealism, cubism, and fauvism, René Lalonde's artwork approaches us with both the emotional force of vivid and unusual color, and the simplicity of flattened out planes, bringing the everyday to life with extraordinary intensity. Though his works are vibrant and intense, they somehow project a sense of calm, serenity, and at times easygoing buoyancy, leaving us wondering as to the nature of this paradoxical effect. René Lalonde was born in Montreal in 1950, the oldest of four children in a working class family. He was drawn to the arts at an early age and bought his first serious set of paints, brushes and canvases at age 12. He proved to be graced with a rich imagination, which flourished during his time spent at boarding school, a confining though ultimately inspiring environment. As the tumultuous 1960s unfolded, Lalonde was swept up in the excitement of rock and roll, the Beatles, and what was to become known as the "British Invasion." The artistic movements spawned in the psychedelic revolution particularly drew Lalonde, leading him to the works of surrealists like Magritte, Dali and Ernst as he explored his own creative drive. Traces of this influence can be seen in the paradoxical effect of Lalonde's works and the sometimes-startling juxtapositions of objects and elements. Lalonde also admired Warhol and Lichtenstein's work as we can see in his focus on everyday subjects. Peter Max's psychedelic posters, all the rage during his teens, ultimately influenced his later-developed fauvist approach with an at-times acid range of color values. Lalonde began to create and sell his own paintings and in 1967 was invited to present his work at a Montreal gallery- his first solo exhibition. It was a resounding success, encouraging him to continue with his artistic development. At the age of 19, he was admitted into L'Ecole du Musée des Beaux-Arts de Montréal, a school attached to The Montréal Museum of Fine Arts. He anticipated learning new techniques and new art forms but left after a year, disillusioned by the way the courses were conducted. Instead, he continued to paint for himself, and began working with an art book publisher. There he discovered Picasso's late Cubism, with its more recognizable forms, and the color and infused light of Parrish and Chagall. Each of these artists was to strongly influence Lalonde over time. The element of light is key to every Lalonde artwork, a presence that gives mysterious 3-D form to the flat geometric planes comprising many of his images as well as a spiritual illumination. His artworks cover a diverse range of everyday subjects though there are a few that are quite distinctive; dramatic arrays of brilliantly colored flowers and vases, lush landscapes tinged with a dream-like atmosphere, and geometric patterns filled with colors fractured into spectacular light and pattern. Regardless of the subject matter, the results are paintings rich with dramatic content and intense color, with a luminous and sometimes whimsical quality. When pressed for a label to describe his style, Lalonde suggests that he creates a sort of "New Modern Art," but adds that the search to label his work often constrains him, so he prefers that each viewer define his art by what they see in it. As his personal vision guides him through each painting, he asks that the viewer allow their own emotions to guide them through the experience of enjoying the artwork. In the late 70s, Lalonde began a series of solo exhibitions throughout Canada. With more exhibits and experience behind him, his artwork was soon represented throughout Canada and the United States. To date, his career includes over sixty solo exhibits worldwide.